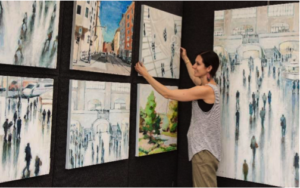 The 14th Annual Artisphere presented by TD Bank, consistently one of the top rated Fine Art Shows in the country, received record high 1,163 artist applications for the 2018 event compared to last year’s 1,136 applications- a 2% increase over 2017 and a 312% increase since the show’s inception in 2005. With 135 exhibitor spaces available, artists that apply to the show can expect about a 1 in 8 chances of being accepted making Artisphere one of the most selective in the country. 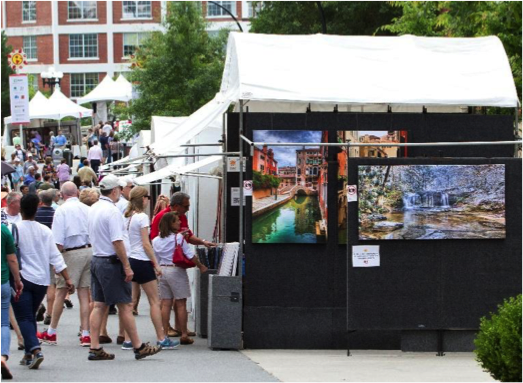 Show organizers attribute the continued growth in applications to the festival’s track record for garnering meaningful sales for participating artists (2017 exhibiting artists reported average sales of $9,150) and its reputation for providing unparalleled amenities. Of the 1,163 applicants, 133 are South Carolinians and 82 of these are from the Upstate. Artists applied from all across the country and 4 international applicants. The largest group of artists, 164 applicants (14%), hail from Florida. More than a third of applicants (394) have never before applied to the festival. The Painting Oil/Acrylic category received the largest number of applications with a total of 160 artists. The Emerging Festival Artist Scholarship Program has continued to draw local artists since its inception in 2012. The scholarship is extended to two artists per year that will be provided a booth, professional photography of their display during the weekend, as well as a mentoring workshop where the emerging festival artists have the opportunity to learn from seasoned Artisphere artists. 24 applications were received for the scholarship program for the 2018 festival- more than double the number that were received in the first year of the scholarship program. Last year’s Emerging Festival Artists were Kiah Bellows (Painting) and Daniel Bare (Ceramics). This year’s esteemed jury panel includes Jay H. Song, Professor and Chair of Jewelry Department, Savannah College of Art and Design, (Savannah, GA), Joseph Bradley, Joseph Bradley Studio, Artisphere 2017 1st Place 2D Award Winner (Greenville, SC), Michael Manes, Director of Blue Spiral 1 Gallery, Board of Directors for the Asheville Area Arts Council, (Asheville, NC), Yu Kai Lin, Kai Lin Art, (Atlanta, GA) and artist Peter Helwing, Artisphere Board of Directors, Visual Arts Committee Chair (Greenville, SC). pecial and invaluable learning experience for artists”. After scores are tabulated, the top 135 artists will be notified of their acceptance to the show in December. A complete list of participating artists will be announced in early 2018.This year’s jury review will be held this weekend, November 4-5. Artisphere 2018 artist applicants who wish to attend may contact Robin Aiken, Visual Arts Programs Coordinator, to RSVP at [email protected] The 14th annual Artisphere presented by TD Bank is scheduled for May 11-13, 2018.